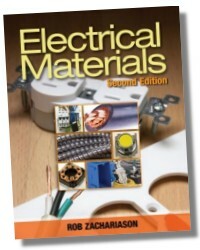 Ideal for anyone new to the electrical industry, this book provides a thorough overview of the variety of electrical materials that are used by today's electricians. Designed to cover essential electrical materials information, the book introduces each material with a photograph and a description. Electrical Materials then progresses to include information on where the part is most commonly seen and how it is used, in addition to its limitations. When appropriate, relevant National Electrical Code articles are noted, so readers have the opportunity to apply their knowledge in a meaningful way, using the leading industry standard. With a straightforward, concise writing style, this book will serve as a valuable training tool, reference book, or supplement to learning the NEC. New fastening systems chapter helps with on-the-job situations. New chapter on utilization equipment such as lights and fans outlines the recent developments in these systems. Expanded image content covers materials and products that are new to the market. Updated to meet the 2011 National Electrical Code®. 128 Pages - 8-1/2 x 11 in. Rob Zachariason is Division chair and instructor of the Construction Trades programs at Minnesota State Community and Technical College, as well as an Instructor for the Joint Apprenticeship and Training Committee. He is a graduate of the Construction Electricity program at Northwest Technical College and the National Joint Apprenticeship Committee's Inside Wireman Program. Mr. Zachariason holds a Master Electrical License in North Dakota and Minnesota. He is a former member of the Board of Directors for the North Dakota State Electrical Board. Rob worked as an electrician for 10 years before becoming a full time instructor. His time in industry was varied, working residential, commercial, and industrial. Rob is a former member of the Board of Directors for the North Dakota State Electrical Board, and is a member of the International Brotherhood of Electrical Workers and the International Association of Electrical Inspectors. He is currently President of Zach's Electric Incorporated.